As learning progresses it becomes more complex. 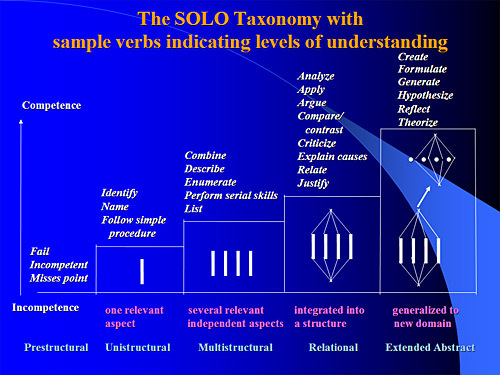 SOLO, which stands for the Structure of the Observed Learning Outcome, is a means of classifying learning outcomes in terms of their complexity, enabling us to assess students’ work in terms of its quality not of how many bits of this and of that they have got right. At first we pick up only one or few aspects of the task (unistructural), then several aspects but they are unrelated (multistructural), then we learn how to integrate them into a whole (relational), and finally, we are able to generalised that whole to as yet untaught applications (extended abstract). The diagram lists verbs typical of each such level. SOLO can be used not only in assessment, but in designing the curriculum in terms of the learning outcomes intended, which is helpful in implementing constructive alignment. SOLO can also explain why those who use low complexity arguments in political or marital disputes usually win – in the short term. But in politics that’s all you need. 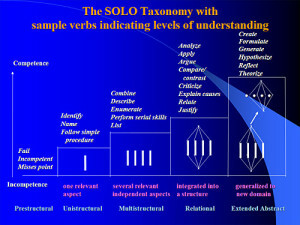 SOLO was first described by Kevin Collis and myself in Evaluating the Quality of Learning: The SOLO Taxonomy (New York: Academic Press, 1982, now out of print, but available in Chinese).